The temple is mounted on circulars piers and there is single drawer placed at the base area with sliding tray in which you can place your puja essentials and lighten up diya or incense sticks.Above that there is main place for the deity where you can place your idols.At the back of the temple there is wooden jaali work done and at the roof top there is single shikhara at the top with its finials. The temple is in Sheesham Wood except for the base where idols are to be placed and the ceiling where dome is placed which is in premium quality plywood.The temple is in Sheesham Wood except for the base where idols are to be placed and the ceiling where dome is placed which is in premium quality plywood. At the top of the temple there is single dome at the top of the temple along floral engraving done over there. Below that there is main place for deity in closed set which give some personal space to your deity.Afterward there are two drawers for puja essentials like incense stick, matchsticks,rosewater etc. The temple is mounted on circular piers and have beautiful carving done by our skilled artisans. 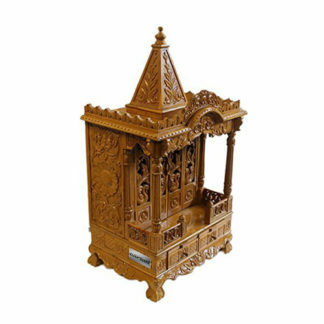 If you are looking for Sheesham Wood Temple , and for other designer Teak Wood Temple for , also at Mango Wood Temple. Its excellent mantap and value for money. Packing was real good, though one piece had come out, which is ok.
Good craftsmanship. Good packing too. Better than expected.